*ZeaGold is a registered trademark of Kalsec. Studies show that Zeaxanthin (zee-uh-zan-thin) increases low macular pigment levels – a leading risk factor for AMD. Our patented formulas contain the highest levels of dietary Zeaxanthin available featuring ZeaGold®*, a natural, highly bio-available Zeaxanthin derived from an exclusive whole food source – paprika. EyePromise nutraceuticals are recommended by thousands of leading EyeCare Professionals every day, and enjoyed by tens of thousands of patients. Zeaxanthin is particularly scarce in the average U.S. diet leaving a significant dietary gap for most people. Our patented formulas contain the highest levels of dietary Zeaxanthin available, helping bridge that dietary gap and supporting ocular health. The body does not product Zeaxathin or Lutein, so nutritional intake and supplementation are key in maintaining healthy Macular Pigment Optical Density (MPOD). Unlike dietary Zeaxanthin, meso-zeaxanthin is a synthetic ingredient not found in the U.S. daily diet, but instead created from a harsh chemical modification of a crude marigold extract. No meso-zeaxanthin publications exist that demonstrate it has been tested by itself without other carotenoids, so any beneficial effects are unknown. 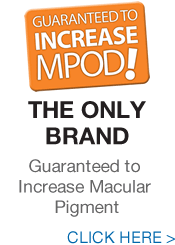 This is also true regarding whether Macular Pigment Optical Density (MPOD) can actually be increased by meso-zeaxanthin alone. The AREDS 2 clinical trial used only dietary Zeaxanthin, not meso-zeaxanthin in its government sponsored trial.